Since 2006, TakeLessons has helped students discover their passion through music by connecting them with the best music teachers in San Diego. Whether you’re looking to take lessons for fun or you’re looking to build a career in music, we have passionate teachers ready to help you achieve your goals. We offer all new students a 100% money back guarantee. If you don’t enjoy your first lesson we’ll refund you’re entire lesson purchase – just give it a try! We only hire the top 8% of teachers who apply with us and every teacher goes through a rigorous interview process, which includes reference and criminal background checks. 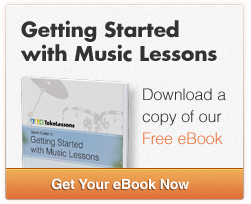 TakeLessons’ teachers specialize in helping students of all ages and levels achieve their musical goals. It’s never to early to begin or late to start so give us a try today! Each TakeLessons student is unique, therefore we recognize that the a student’s lesson plan should reflect that. You’ll work with your instructor to develop a lesson plan suited to meet your specific goals. TakeLessons offers 38 lesson types, from singing and guitar to the harp and the banjo, so whatever you musical interest we’re sure to have the lesson to match. Our most popular music lessons include: singing, guitar, piano, drums and violin. Give us a call at (877) 231-8505 or fill out the form at the top of the page to get started today! 100% Privacy. We will never spam or sell your info.